Earlier today, Evernote updated its Windows client to bring it in line with the Mac version but the online note-taking company isn’t done with product releases just yet. It’s also added a number of useful features to its iOS app to improve content discovery, editing and more. Evernote for iOS 5.4 now includes shortcuts — formerly known as favorites — which let users keep important information in an easily-accessible tab for quick access from their device. Shortcuts can be notes, notebooks, tags or even saved searches, and are synced across all versions of the service for convenience. The iOS app is also being given a couple of new features to help the discovery of older content that users have saved. As the name suggests ‘recent notes’ displays recently created notes at the bottom of an open note. In addition, users of Evernote’s paid-for Premium service will also get a ‘related notes’ feature which — again, as the name suggests — surfaces previous notes that are related to the note that is being viewed or worked on. Evernote has also extended the integration of its Skitch drawing app with the Evernote iOS app. Users with both services installed on their phone are able to annotate notes using Skitch directly from the Evernote iOS app, while Premium users have the ability to edit PDFs too. 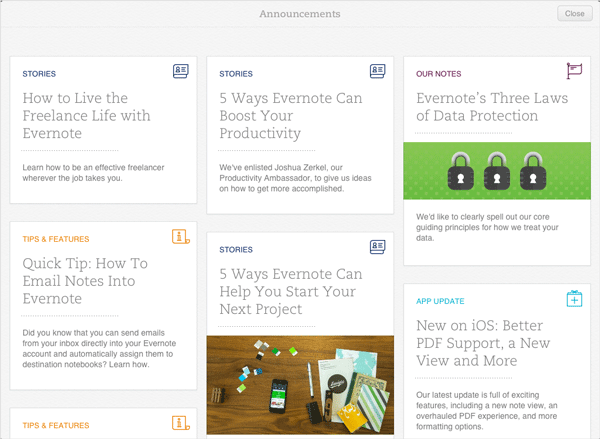 In addition to “speed and stability improvements” improvements, Evernote has added one final feature: announcements. 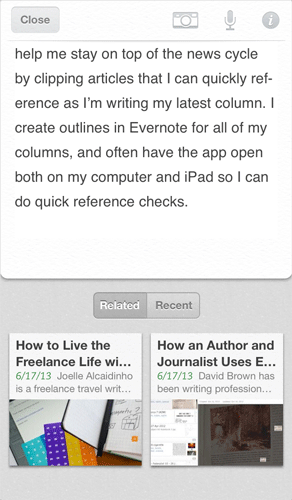 This allows iOS users to find the latest app updates and tips/tricks which Evernote posts to its product blog right from their device. Announcements can be accessed via the ‘bugle’ icon in the app. The icon will display a notification when new content is posted, and showcase the latest posts — as below. These changes are subtle but will be welcomed by anyone who uses the app on their phone alongside other clients — as I do — since it makes content discovery all the easier, and gives more powerful options for editing on the go. There’s also further incentive to upgrade to the Premium service — which costs $5.00 per month or $45.00 per year. 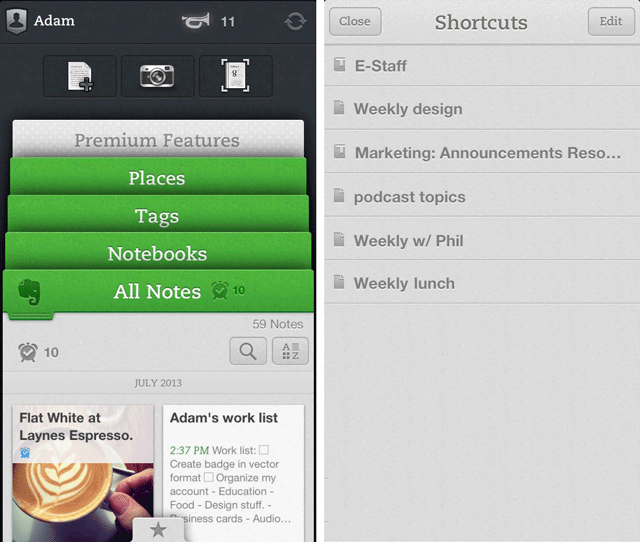 Evernote turned five last month and it has more than 65 million users worldwide.